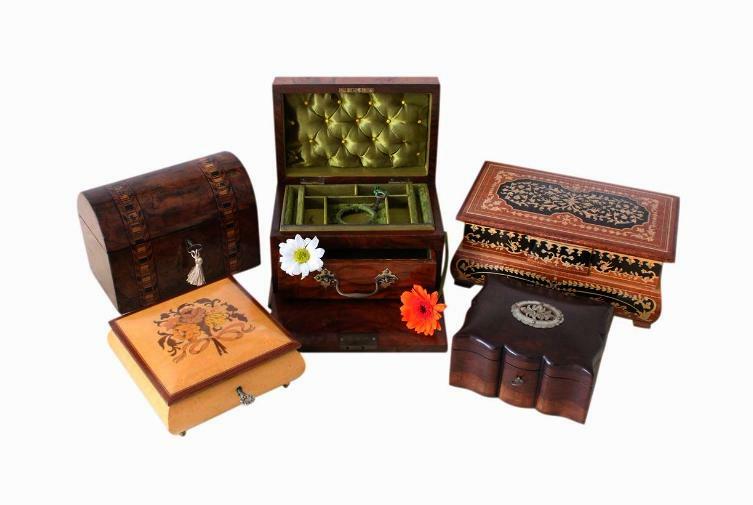 If you're looking for a particular type of jewellery box, we will endeavour to find it for you! Simply contact us here and let us know your requirements. These could include age/period such as Victorian or 1930s Art Deco, style/design such as Musical or Inlaid, the exterior material such as Walnut, Mahogany, Leather or Silver, and the interior material such as Satin, Silk or Velvet. Our sourcing service is completely free of charge and there is no obligation to purchase the box we find for you. Below are a selection of boxes we have sold, which may be of some inspiration to you. Please click on their images to view more photos and their descriptions. If you'd like to acquire a similar box to one of these below, then please quote its item no and title when you contact us. Superb large quality Italian jewellery box with beautiful burl wood veneer. Lovely raised panel to the lid. Multiple compartments with soft velvety flock linings. Beautiful antique Walnut veneered jewellery box dating to 1860. Superb Berlin Strapwork inlay and gilded brass carouche and escutcheon. Stunning partially refurbished silk and satin lined interior. Beautiful antique Victorian jewellery box, dating to 1860/1870. Lovely Rosewood veneer with a vast array of ornate inlaid decoration. Refurbished satin lined interior. Working lock and key. Lovely small vintage Italian jewellery box in the novel form of a volume of books. Beautiful marquetry inlay to the lid and original soft plush felt lined interior. Superb large antique jewellery box with beautiful Rosewood veneer. Stunning refurbished satin lined interior and beautiful Mother of Pearl cartouche and lock escutcheon. Working lock and key. Stunning 1930s jewellery box with a myriad of exotic wood veneer and marquetry inlay. Newly refurbished satin lined compartment which is deep and spacious. Original working lock and key. Lovely vintage 1950s Retro jewellery box. Satinwood and Black Walnut veneers, and three interior compartments with their original red satin linings. Polished gold metal bun feet. Beautiful vintage jewellery box with large 3 dimensional carved Roses and leaves. Lovely handmade box made of various woods. Two compartments with new cushioned red felt linings.